>Post-communist democratization: Is your name.. Rumpelputin? Late at night I’ve been sitting up reading: reading Democracy and Authoritarianism in the Postcommunist World (Cambridge University Press) edited high-powered US specialists on communism and post-communism. McFaul is now a senior advisor to the Obama presidency at the National Security Council. This new collection – available in paper and hardback and Kindle – basically tries to regime change in the former communist world into a new perspective by linking the collapse of one-party rule in 1989-1991 with more recent experiences of democratisation in Eastern Europe and the former USSR. 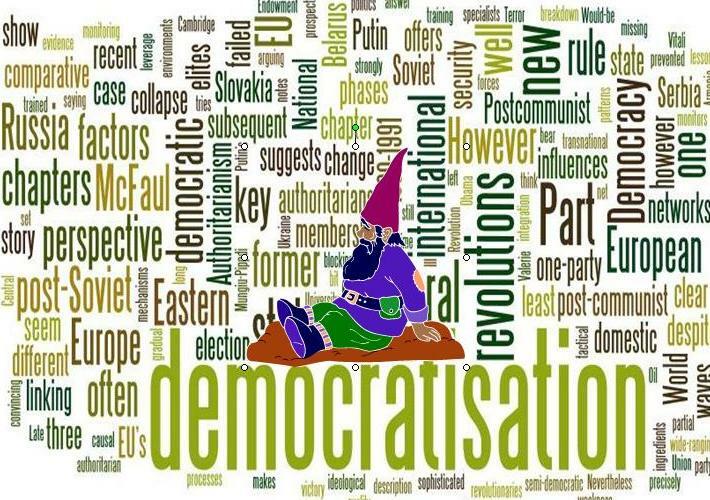 As the editors argue in the opening chapterswe should think of postcommunist democratisation as three overlapping phases: 1) the breakdown of Communist Party rule in the late 1980s; 2) democratisation processes in 1990s driven by the prospect of EU membership, which stopped some new democratic states in Central and Eastern Europe sliding into semi-authoritarianism; and 3) more recent ‘coloured revolutions’ in the former USSR, which were triggered by electoral fraud in states without any clear prospect of joining the European Union. And what’s more Michael McFaul suggests, theses three phases underline the role of the international system as a missing (or at least, under-played) variable which has shaped the different waves: the collapse of Soviet power and its later re-emergence under Putin; the EU’s decision to enlarge Eastwards; and a growing US preoccupation with the ‘War on Terror’ after 2001. However, contributors differ in their views of precisely how – and how strongly – international influences have come to bear. Milada Anna Vachudova sees EU leverage on CEE’s more problem atic states as a key motor of liberalisation and reform, while– despite making points similar things in a slightly different language – Alina Mungiu-Pippdi at bottom claims that the EU’s political conditionalities were easily bypassed by anti-reform elites. Horizontal economic integration and broader European norms were, she claims, the important factors. Sadly, this is the type of domestic vs. European factors arguments that no one has convincing really worked out how to settle. Similarly, in his finely-researched chapter on Ukraine’s ‘Orange Revolution, McFaul is unable to conclude more than that US and international influences were indirect, although here one detects a certain politically inspired pulling of punches. There seems plenty of evidence in McFaul’s thoroughly researched chapter for arguing the case one way or other and if I was in the opposition in a semi-authoritarian state, I surely as hell would want USAID and the National Endowment for Democracy training my youth volunteers and election monitors and bunging a bit of cash to friendly NGOs. As Valerie Bunce and Sharon Wolchik note, changes the geo-political environments mattered because they altered the incentives of domestic actors and changed patterns of diffusion between states. Diffusion mechanisms – while always at work- evolved over time. Would-be democratic revolutionaries in Eastern Europe have been copying tactical innovations; drawing parallels between national contacts; and forming of collaborative networks since at least 1980, if not 1848. 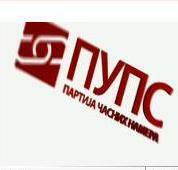 However, as various lcase study chapters on ‘electoral revolutions on Slovakia (1998) and Serbia (2000), Georgia (2004), and Ukraine (2004) make clear by the millennium the transnational activist networks and election monitoring had become the key paths for change. However, post-communist authoritarians too have been learning lessons. As Kathryn Stoner-Weiss and Vitali study on Putin’s Russia and Lukashenko’s Belarus – and Lucan Way’s comparison of post-Soviet authoritarianisms – show, an effective formula for blocking democratisation is at hand: the key ingredients are well trained, well paid security forces; regaining Soviet-era levels ofcontrol of the media and the economy; a well organised new ruling party backed by some kind of an ideological claim to legitimacy s Nevertheless, extreme weakness of post-Soviet state institutions can be a still more fundamental obstacle to democratisation: Scott Radnitz illustrates the point bluntly in a chapter arguing that Kyrgyzstan’s repeated ‘electoral revolutions’ are more a sign of failed statehood than social pewssures for democratisatio. As the book shows, despite the Year of Miracles in1989 – the dominant image of regime change for Western obsevers – post-communist transition has most often been a story of failed or partial democratisation creating semi-democratic ‘hybrid regimes’, whose closed political systems, semi-open societies and corrupt public adminstration set the scene for further democratic upheavals. The net effect of such waves, however, has been a gradual polarisation of the region’s initially weak democratisers into consolidated (if low quality) democracies (Romania, Bulgaria, Serbia and Slovakia) and consolidated autocracies (Russia, Belarus, Armenia). As you would expect, Democracy and Authoritarianism in the Postcommunist World offers a wide-ranging and sophisticated overview of South East European and post-Soviet democratisation By joining up Europeanisation, ‘electoral revolutions’ and transitions from one-party rule in 1989-1991, it offers an original perspective highlighting the unfolding of a kind of Kondratievian long wave of democratisation across a single region. However, I found explanation and description in the book were too often blurred. Many of the causal factors its contributors highlight beg more questions than they answer. Why were some authoritarian elites more united in the face of opposition? Why were some security and police apparatuses more cohesive? Oil, victory in neighbourhood wars and timing all seem to be part of the bigger story. Too often, however, we are left with accounts where wily authoritarians like Putin or Lukashenka appearing Rumpelstiltskin-like at the wrong moment. If only they would disappear as easily. What can you do in the Czech Republic over several sunny summer days, but eat ice cream, have the odd, beer, seek out the local lido, read all the newspapers and steadily do the usual tour of all the in-laws. Actually, things seem to getting a bit more difficult than they used to be: tougher hygiene regulations and the filtering down of EU structural funds to local politicians and busipeople have seen the closure of a lot of traditional open air municipal pools and their replacement with self-styled ‘Aquaparks’ charging double the price which have plenty of water slides and flumes for the kids, but basically nowhere to swim. Even allowing for the traditional ‘cucumber season’ when there is little hard news, there seems less and less to read in the Czech papers and, if buy five national dailies, you should manage to read most of the interesting news in about half an hour. There even seems to be fewer brands of beer to choose from and the local Janáček brew – nothing to do with the composer in case you were wondering – has daftly rebranded itself as Patriot, presumably in an effort to combine regional appeal with an up-to-date, English sounding moniker. 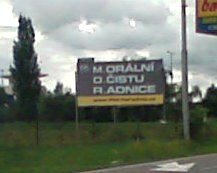 There is, however, a little politics to be seen on the highways and byways of Moravia: as we head down from wooded country into agricultural district in search of an old style koupák to swim in, I spot a billboard left over from the election campaign – probably paid for by the Social Democrats – slagging rising new parties TOP09 and Public Affairs (VV), by warning that popular TOP09 figurehead Karel Schwarzenberg will soon by given the chop by ruthless, much less popular TOP deputy leader Miroslav Kalousek. VV leader Radek John is also there in dark glasses, looking vaguely goonish. In reality, post-election Mr – or, in fact, I should say Prince – Schwarzenberg seems to be quietly slipping out of the limelight of his own accord to get on with the business of running Czech diplomacy as Foreign Minister, and the thought of Radek John, now Interior Minister, as sinister backroom operating would make anyone smile given his bumbling and incompetent first month in office: his floundering performance in a TV interview struggling to explain what his ministry’s strategy director did is already the stuff of legend. 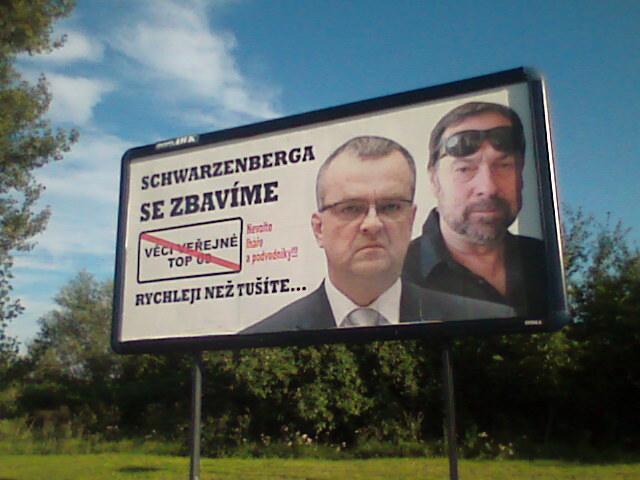 The local elections scheduled for October also seem to throwing up some fascinating contests: all eyes are currently on the Alien Versus Predator type battle between the Civic Democrats and TOP09 that is taking shape in Prague, but in Zlín the long, long central boulevard of hypermarkets, industrial units and public building is replete with billboards for a new movement of local independents called Moral Clean-Up for City Hall (MOR), which despite the name seem to be a standard outfit of anti-politically minded worthies not a group of Christian fundamentalists: on the other hand, where does a scratch list of civic minded citizens get hold of the cash for a 30 billboards? Not to mention a snazzz and professional webiste. The regional daily Zlínský deník said that MOR was ‘funded by another electoral list’ – presumably as some kind of spolier party’ – producing howls of protest for the new group, but hard information seems hard to come by. 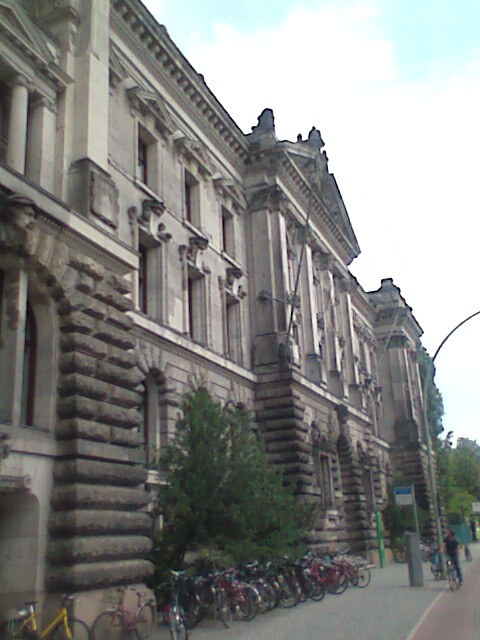 The last few days have found me at a workshop on populism and democracy in Europe and Latin American at the Wissenschaftzentrum in Berlin, trying to see what the (politically) late and unlamented Dr Sládek and his far right Republican Party can contribute to debate about comparative populisms. It’s been a mixed experience from the outset: a smooth train journey to Luton is followed but a hellish two hour Easyjet check in queue and stressful sprint across the airport to get to the departure gate; Berlin’s Schonefeld seems to be the Luton airport of Germany, but after a long trek to the station all is redeemed by a fantastic Wurst with lashing of mustard at a down at heel kiosk and a soothing Russian fairy story my Ukrainian fellow passengers on the train into town are reading their small son. The academic side is similarly mixed: I take my hat off to Kevin Deegan-Krause’s superb discussion of populism and democracy, which somehow slipped into his paper on Slovakia, and watch him editing his powerpoints only to discover that he is, in fact, doing an on the spot analysis elegantly integrating the diverse mix of cases. If I still had a metaphorical hat , I would need need to take it off again. Dr Sládek and his party, however, seems to be a less than useful addition to proceedings: too small to have much influence on Czech democracy and too defunct to be very interesting. My discussant helpfully suggests there might be some kind of legacy stemming from Dr S, but the contemporary Czech far-right is so marginal – and so varied – that it must at best be a micro-legacy and More generally, it is hard to avoid the impression that European and Latin American cases, as too often with inter-regional studies, are passing like ships in the nights: superficially united, like the city itself, but with a host of underlying differences. I am dog tired. Early the next day I get a yellow double decker and watch an odd mix of 19th century, state socialist and ultra-modern buildings drift by until we pass the Bundestag and get to the Hauptbahnhof. Right platform, right carriage, right seat and go sleep. When I wake up we are Dečin. There is no border control now, but the train has broken down. and a locomotive needs to be rep[laced (it is, 20 minutes later) There is torrential rain. Outside the river Labe looks fit to burst its banks (it does two days later). 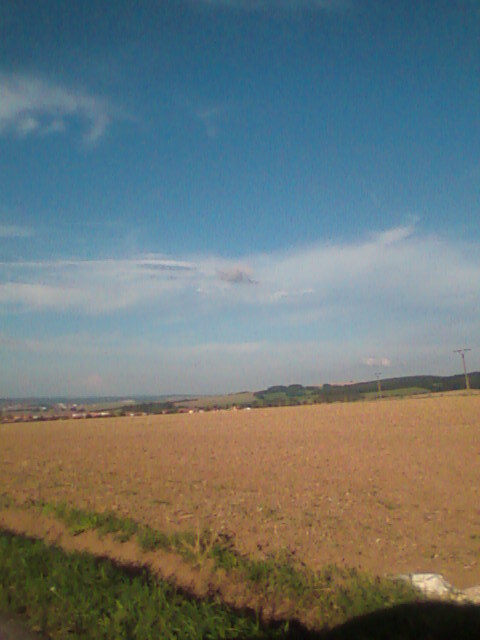 Despite the dire weather and the black skies, as sometimes happens, I really am glad to be in the Czech Republic.